Her mother's untimely death, a struggling marriage, a strained relationship with her sister, Rose, and regrets over what might have been haunt her. Despite being a wife and mother, she feels she has little to show for her life. Still single, she longs for a husband and children. But Angela has all that and still isn't happy. Rose wants to be closer to her older sister, but she and Angela couldn't be more different. Both strong women, will their sibling rivalry ever end? 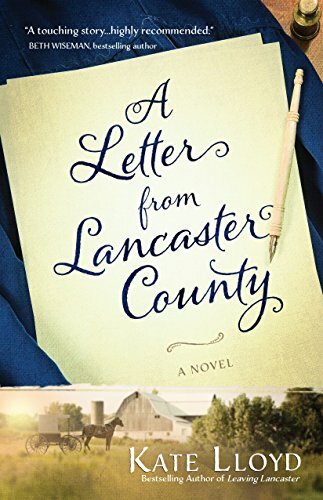 Kate Lloyd captures each character perfectly in A Letter from Lancaster County. Page after page I became totally absorbed in the lives of these two sisters and their aunt. The emotional conflict with the two sisters was understandable and I hoped for a better relationship. It's amazing how actions and words can quickly get mistaken for something else. Also the view from the outside of someone's life can look near perfect (or not) until we begin to delve into their heart and background. Kate Lloyd brings that all to us with a reminder of God's healing in our lives. I loved the aunt in this story. She knew when to be quiet and not say too much. She also accepts that she is not perfect, but tries to do the best she can, in the here and now. All that including a nice romance with a twist that I didn't expect, made this a wonderful story. Perfect. I received this book from the author and was not required to give a positive review.